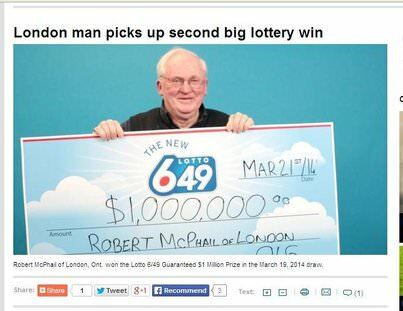 Robert McPhail of London, Ontario celebrated his second significant lotto 6/49 win after he scooped a $1 million in the March 19th draw. His first win had only been a $571,157 jackpot he shared with seven others way back in 1992. McPhail claims that as he was in the Shoppers Drug Mart on Adelaide Street buying newspapers and chocolates, something just told him to buy a ticket. He gave in to the urge and bought two 6/49 tickets, and one of them was the winner. He also says he had always known that he would win again. Now family members are trying to get his luck to rub off on them. McPhail wants to visit the UK with his wife and perhaps go on a fishing trip with his grandchildren.